The best option for seeing all of the project details is to run a Related Filings Report. This feature is available to all users, but is most frequently used by those associated with the closing process and who are responsible for collecting lien waivers/releases. Essentially, it shows who has filed their Notice (demonstrating their involvement in the project) to date. Sign up to use the LiensNC system or login with your existing user credentials. ADVANCED SEARCH - Use project details to perform an Advanced Search. Examples might include searching for the property address or owner's name. Keep in mind, there are thousands of filings in the system, so performing an Advanced Search is much more challenging than performing an Entry Number Search. 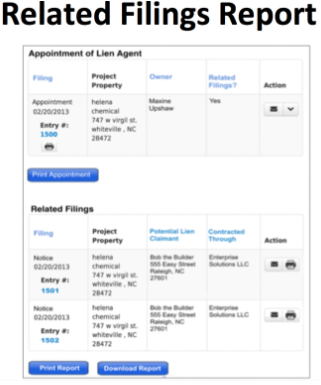 Once the Appointment is located, you can view the related filings by selecting the RELATED FILINGS REPORT option from the Action drop-down menu. From the Related Filings Report page, the original Appointment filing will be listed at the top of the page, followed by the related Notice filings (if applicable) listed below. PRINT REPORT - Gives users the ability to print a Related Filings Report that includes all of the information that displays on the web page version of the report. DOWNLOAD REPORT - Gives users the ability to export a copy of the report that includes all of the information that displays on the web page version in addition to a date and time stamp indicating when the report was generated. This is particularly helpful to assist with determining whom you have contacted to ensure they were paid.